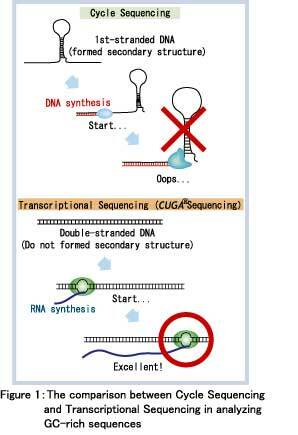 The CUGA® Sequencing System is a product which Nippon GeneTech Co., Ltd. has developed to commercialized Transcriptional Sequencing which utilizes the RNA polymerase to analyze sequences. The principle of TS is based on the dideoxy terminator method by Sanger F., which uses a DNA polymerase, but it has great advantages over the conventional sequencing method using a DNA polymerase. 1. Without purifying the PCR product, it is possible to bring in the sequence reaction just as it is. In Cycle Sequencing using a DNA polymerase, 2'-dNTP has been used as a substrate in both the PCR and sequencing reaction in the case of template DNA preparation using PCR. In Transcriptional Sequencing, on the other hand, RNA polymerase doesn't capture 2'-dNTP but rNTP because the sequencing reaction is based on in vitro transcription. Therefore, a PCR cocktail can be used directly on the sequencing reaction just as it is without purifying the PCR product. The condition of reaction 37℃, 60min. many steps of temp., 2〜3hr. 2. It achieves a great result in analyzing the template DNA which was difficult to analyze using Cycle Sequencing. In Cycle Sequencing using the DNA polymerase, a double-stranded DNA is denatured to a single stranded DNA at the first step of the reaction. This step is necessary to anneal the primer which is indispensable for the initiation of the DNA synthesis. If you use the template DNA with GC-rich sequences, palindromic sequences and so on, the secondary structure occurred, however, it became the obstruction factor in this step. In Transcriptional Sequencing, on the other hand, it doesn't require the denaturing step which easily forms the secondary structure and this is a great result in terms of analyzing the template DNA with GC-rich sequences, palindromic sequences and so on. 3. It is possible to react at isothermal, short-time condition (37℃, 60min.). In Cycle Sequencing, 3 steps: denatured, annealing and elongation are indispensable. The temperature is set using a Thermal Cycler and the reaction takes 2 to 3 hrs. In Transcriptional Sequencing, on the other hand, it is possible to achieve an easy and speedy sequencing reaction: isothermal reaction (37℃ and short-time reaction (60min.). You don't need a Thermal Cycler and a long waiting time! Moreover, with our special Transcriptional Sequencing System "CUGA® Sequencing System", it is possible to analyze the template DNA at both ends with T3 and T7 promoter sequences usingCUGA®3 andCUGA®7 RNA polymerases. Also, you can use your DNA sequencer; you don't need to purchase a special type of DNA sequencer for Transcriptional Sequencing. We are preparing the application regarding the indispensable promoter introduction for Trascriptional Sequencing.